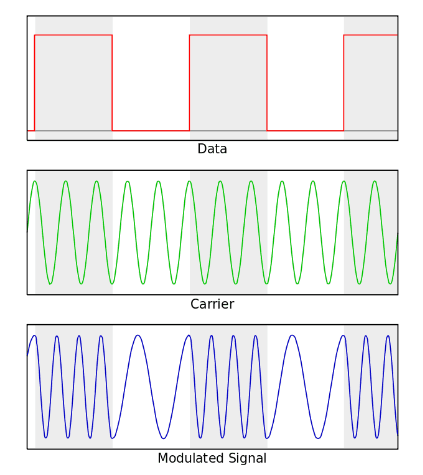 Frequency Shift Keying (FSK) is a digital modulation technique in which the frequency of the carrier signal changes according to the input binary data. This is used in communication systems such as amateur radio, caller ID, and urgent situation broadcasts. The output of a FSK modulated wave is high in frequency for a binary High (‘1’) input and is low in frequency for a binary Low (‘0’) input. With this scheme, the “1” is called the mark frequency and the “0” is called the space frequency. 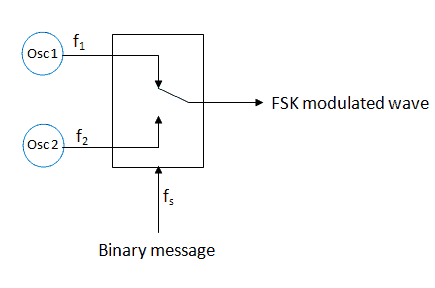 Fig.2 shows the block diagram of a FSK modulator. As shown in fig.2, it consists of two oscillators with a clock and the input binary sequence. The oscillators Osc 1 produces a higher frequency (f1) signal whereas the oscillator Osc 2 produces a lower frequency ( f2) signal. These two oscillators are connected to a switch along with an internal clock. To avoid the abrupt phase discontinuities of the output waveform during the transmission of the message, a clock is applied to both the oscillators, internally. The binary input sequence is applied to the transmitter so as to choose the frequencies according to the binary input. There are different methods for demodulating a FSK wave. The block diagram of Asynchronous FSK detector is shown in Fig.3 below. It consists of two band pass filters, two envelope detectors, and a decision circuit. The FSK input signal is passed through the two Band Pass Filters (BPF 1 and BPF 2) and tuned to Space and Mark frequencies. The output from these two BPFs look like ASK signal, which is given to the envelope detector. The signal in each envelope detector is modulated asynchronously. The decision circuit chooses which output is more likely and selects it from any one of the envelope detectors. It also re-shapes the waveform to a rectangular one. The block diagram of Synchronous FSK detector is shown below in Fig.4. It consists of two mixers with local oscillator circuits, two band pass filters and a decision circuit. The FSK signal input is given to the two mixers with local oscillator circuits. These two are connected to two band pass filters. These combinations act as demodulators. Then the decision circuit chooses which output is more likely and selects it from any one of the detectors. The two signals have a minimum frequency separation. For both of the demodulators, the bandwidth of each of them depends on their bit rate. This synchronous demodulator is more complex than asynchronous type demodulators.